When WoodWing Enterprise is integrated with Elvis 5, assets that are stored in Elvis can be exported to Enterprise for use in a production workflow. When a user wants to export assets to Enterprise, the Enterprise Server to export to needs to be chosen first. The names and locations of these Enterprise Server instances are stored in the WWSettings.xml file, a file that is used by Enterprise Server and its clients to communicate with each other. Elvis Server retrieves this information from this file and makes it available as options to choose from in the Export window in the Desktop client. Figure: Choosing the Enterprise Server instance to export to in the Desktop client. It is assumed here that you have such a file available or at least have the URLs of the Enterprise Server instances. Making the WWSettings.xml file available can be done on Elvis Server or on the system where the Desktop client is installed. If the WWSettings.xml file is present on both locations, the files will be merged. When duplicate entries are encountered, those from the file on the client system are preferred. Only the locations of the Enterprise Server instances are retrieved from the WWSettings.xml file, all other settings are ignored. Step 1. In the Config folder of your Elvis installation, open the folder named sce_export. Replace the empty WWSettings.xml file by a fully configured version. Open the emtpy WWSettings.xml file and add the URLs to Enterprise Server between the <SCEnt:Servers> </SCEnt:Servers> tags. Step 3. Restart Elvis Server. true (default). 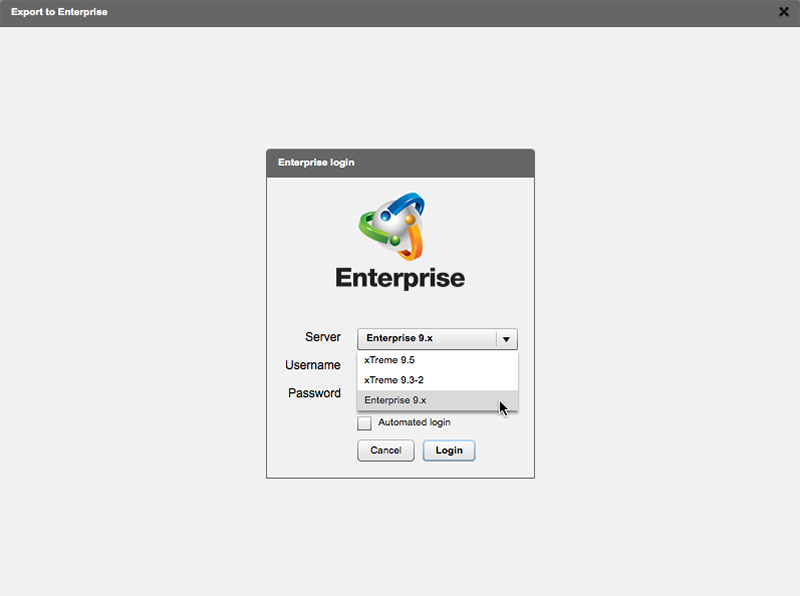 The exported assets are routed to the user which credentials were used for logging in to Enterprise. false. The exported assets are not routed to a user. auto (requires Elvis 5.24 or higher). The assets are routed to a user or user group, based on the Route To rules set up in Enterprise Server. 3 May 2017: Added info about automatically routing the exported file to an Enterprise user. When will it be possible to export from Web Pro Client to Enterprise? We dont have an exact time line when this will be added, for now the user would need to drag & drop the files to Content Station or to the Layout. Smart Connection will add the images to Enterprise when they are placed on the Layout. Small note, it is better to use the product feedback fora to discuss functionality.